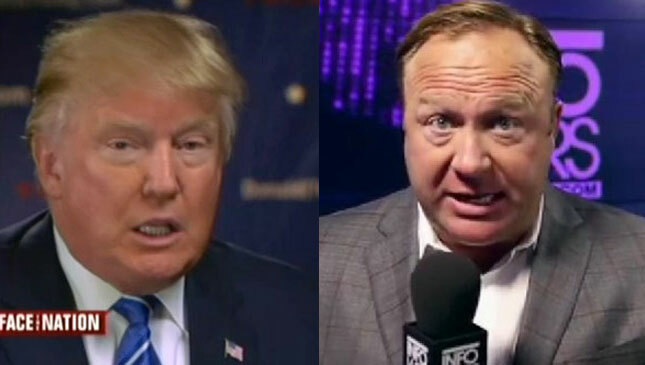 Alex Jones announced  on his radio show this week that it has been “surreal to talk about issues here on air and then word-for-word hear [Donald] Trump say it two days later. It is amazing.” Indeed, as MSNBC’s Chris Hayes pointed out , it has been “completely surreal” to watch the Republican nominee for President of the United States echo the nation’s most prominent conspiracy theorist; but he’s done just that, repeatedly. Jones’ website Infowars.com has described  him as “one of the very first founding fathers of the 9-11 Truth Movement.” The movement believes that the U.S. government was behind the September 11, 2001, attacks. Jones also has promoted conspiracy theories about government involvement in the Oklahoma City bombing, the Space Shuttle Columbia disaster, the Boston Marathon bombing, and several mass shootings. Jones has also often hosted Trump friend and adviser Roger Stone, who maintains close contact with the candidate. Trump and Stone coordinated  a rally in favor of Trump at the convention and have given out  instructions on how to donate to Trump’s campaign. In February, a senior Trump adviser gave  an interview to Jones' website and urged Jones' fans to vote in the South Carolina and New Hampshire Republican primaries. Jones has often  promoted  the birther conspiracy that President Obama was not born in the United States, a nonsense theory that Trump has eagerly pushed . Infowars promoted  the idea that Supreme Court Justice Antonin Scalia had been killed around the same time Trump floated  the theory in an appearance on Michael Savage’s radio show. And when Trump argued , without evidence, that Ted Cruz’s father Rafael Cruz was involved  in the assassination of John F. Kennedy, he was echoing a claim that had already been made on Jones’ website .